A gripping, true-crime debut of imprisonment, escape, and survival from New York Daily News crime reporter Chelsia Rose Marcius. On June 6, 2015, inmates Richard Matt and David Sweat escaped from Clinton Correctional Facility, New York State's largest maximum security prison. The media was instantly obsessed with the story: aided by a prison seamstress, who smuggled hacksaw blades, chisels, and drill bits inside the facility via a vat of raw hamburger meat, the two convicted murderers sliced their way through steel cell walls, meandered through a maze of tunnels, climbed out of a manhole, and walked off into the night. Only a handful of inmates had successfully broken out of Clinton since the facility opened in 1845, and not many had made the attempt. 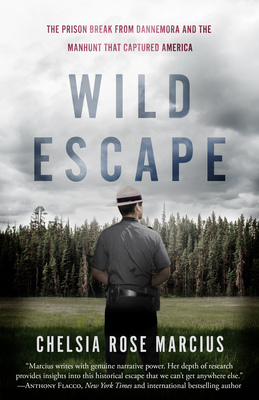 Barbed wire, stone walls, and the wilderness of the Adirondacks have all served as physical and psychological barriers to freedom. This seemingly impossible Shawshank-esque escape had the makings of a Hollywood film, and the public hung on to every twist as the story developed. After nearly three weeks on the run, U.S. Customs and Border Patrol agent Christopher Voss shot and killed Matt on June 26, 2015. Two days later New York State Police Sgt. Jay Cook shot Sweat twice in the back. He survived. While we have come to learn how Matt and Sweat pulled off perhaps the most elaborate modern day prison break, no reporter, except Chelsia Rose Marcius, has talked directly to Sweat to ask the most important question in the case: Of all the inmates who dream of escape, why was he the one who could make it happen? "The details Marcius has amassed are comprehensive and stunning and serve to heighten the impact of her story. This is first-rate journalism, written about a crime and a criminal from the inside out." --Stephen Singular, New York Times bestselling author.